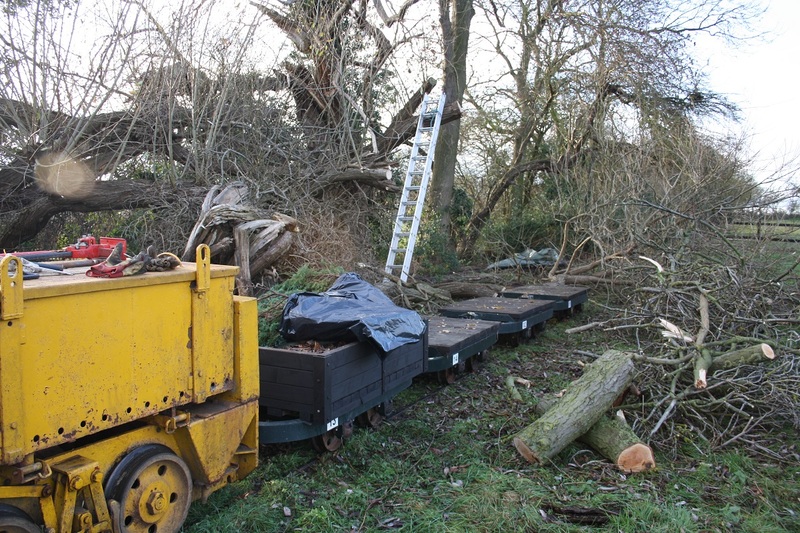 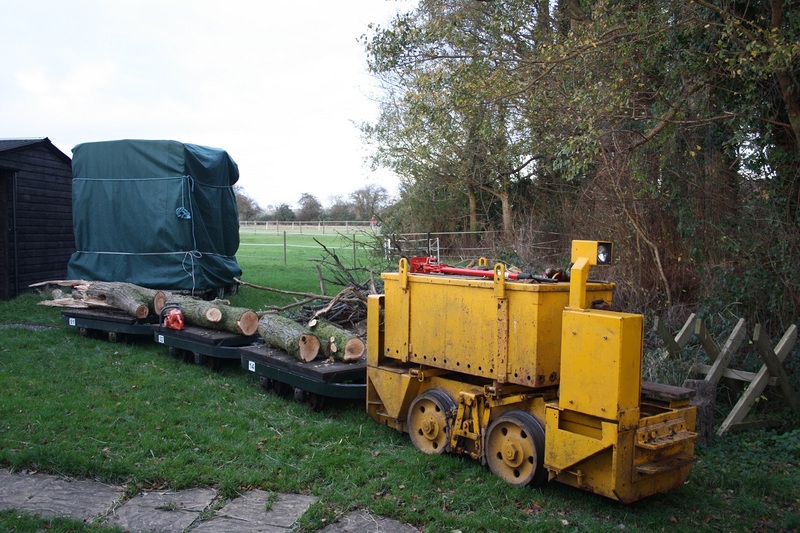 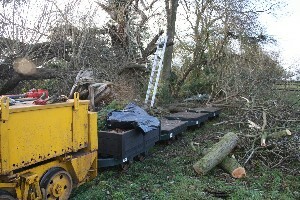 No major project being undertaken at this time, apart from a wagon re-build and clearing the line after major tree damage over the winter. 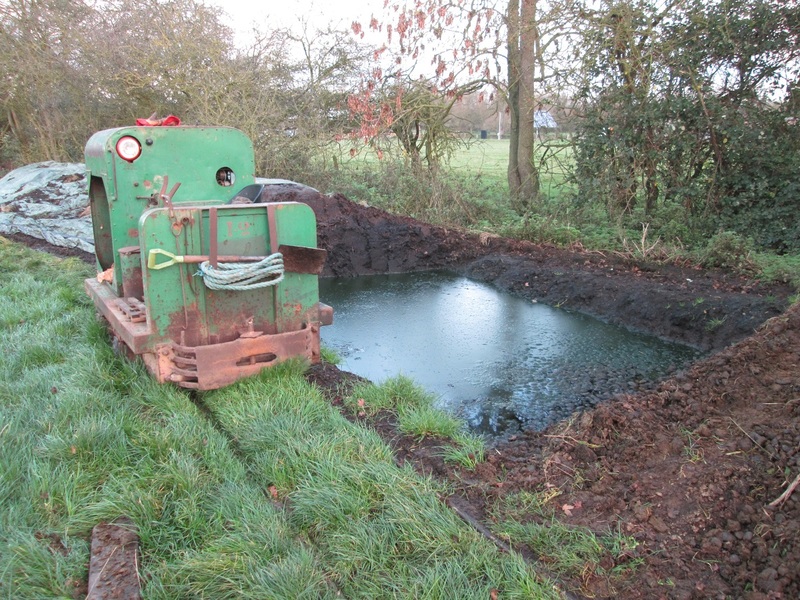 Over winter the muckheap can resemble a small swimming pool making it difficult to do any digging out during winter months. 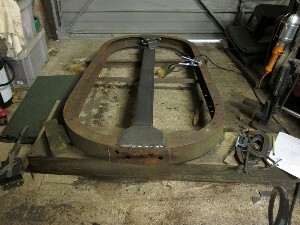 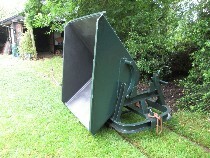 As the skip frame did not have any coupling pin holes, a couple of brackets were welded up from a large piece of square section. Meanwhile the frame now had the strengthening bar welded in the length of the frame and plates welded in at each end. 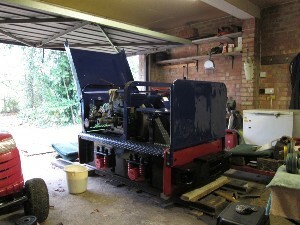 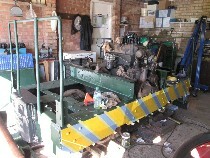 Jane the Motor Rail was drained for the winter and everything greased up before being backed into her shed for storage. 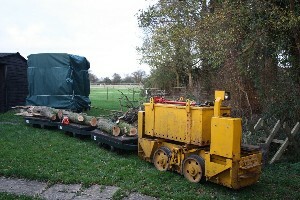 Some of the more manageable logs were transported down to the area for cutting and splitting. 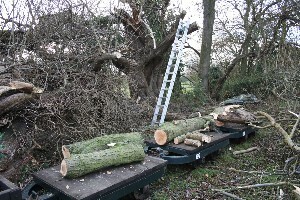 Loading the logs once sections of the fallen tree had been cut up. After clearing the tracks a little, a few flat wagons could get far enough in to allow loading after a bit of work with the chainsaw. 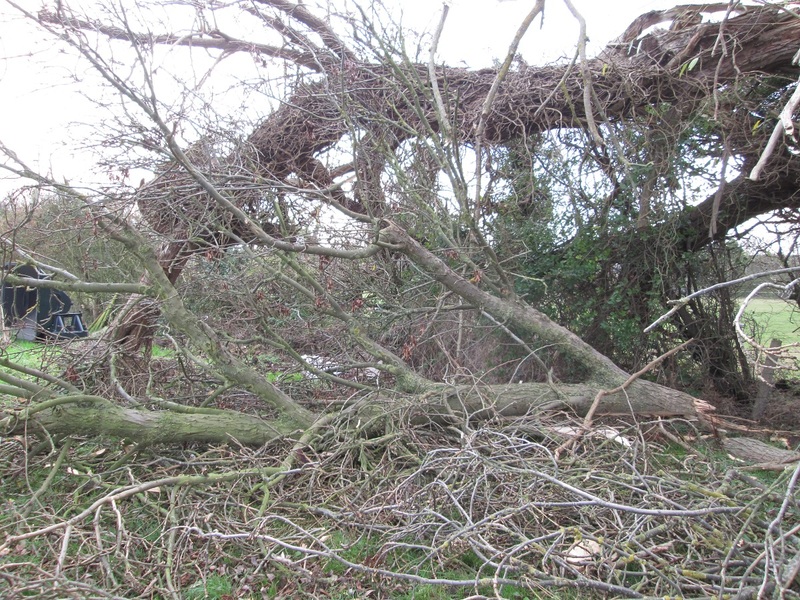 The strong winds had brounght down more of the large willow tree and although no damage was caused, it had blocked the tracks. 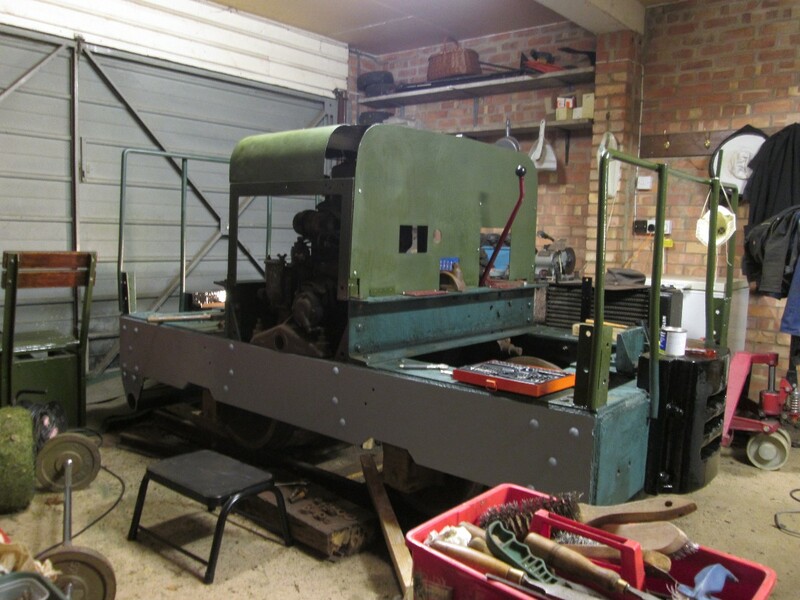 The hudson chassis that had been cleaned up earlier in the year was now stripped down and prepared for the addition of a steel section running the full length to give it more strength. 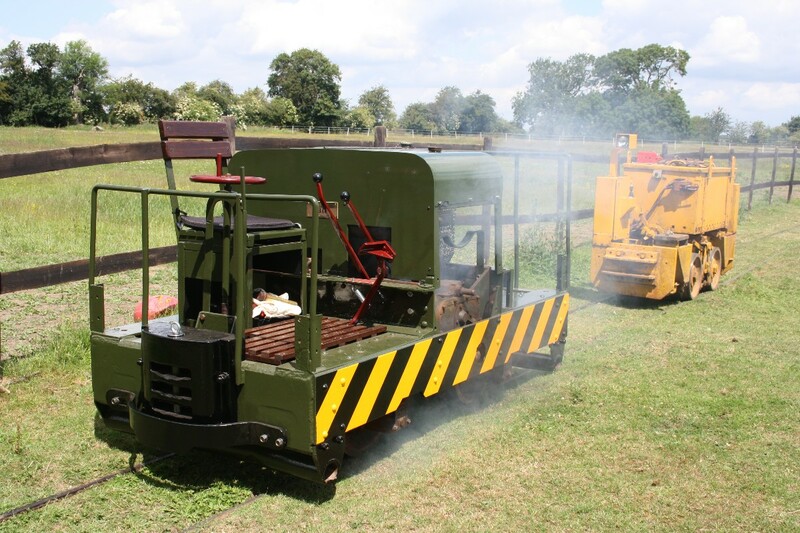 The Spoorijzer had a few small jobs completed, including fitting a stop on the throttle to give a consistent mimimum tickover speed. 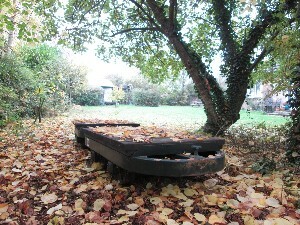 In the garden the falling leaves were now giving everwhere a very autumnal feel. 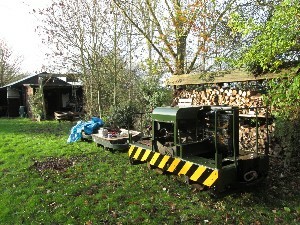 More splitting of logs was carried out to build up supplies of firewood for the imminent winter weather. One of the sidings had to be relaid away from the fence to allow enough room to build a open stock shed and give more of the rolling stock undercover storage. 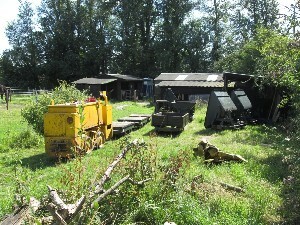 The W&R loco at the muck heap ready for another session of digging out. 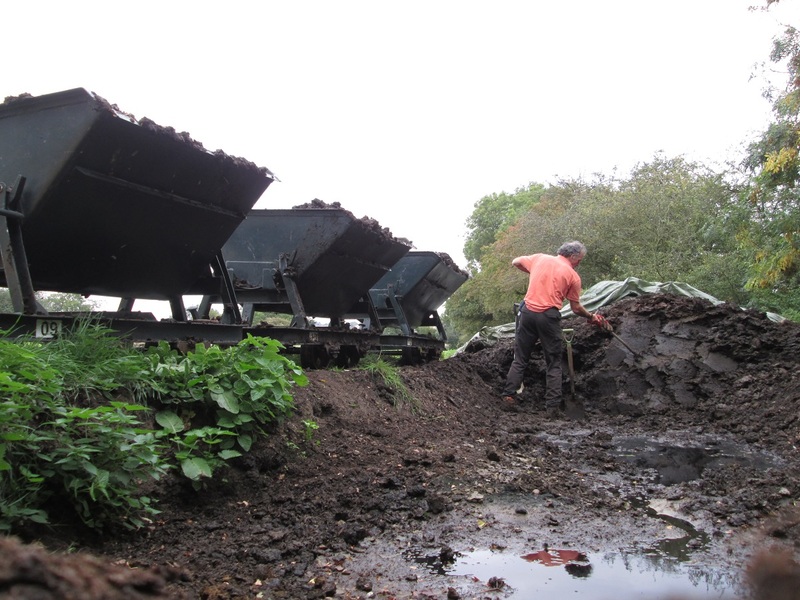 Conditions are starting to get a little 'muddy'! 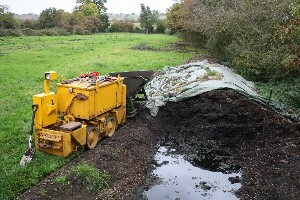 No.10 taking it's turn for muck transport duties. 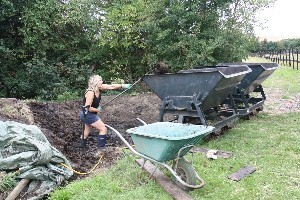 Late summer sees all hands to the pump to dig out as much compost as possible to give enough room in the muck heap for the coming winter. 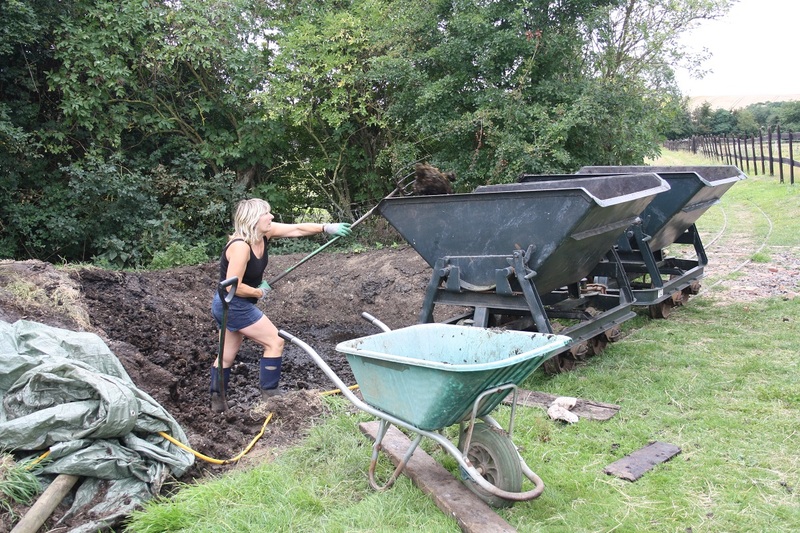 With no mechanisation, filling three skips is a slow process! 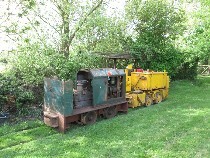 Another short train ready to depart hauled by the W&R loco. 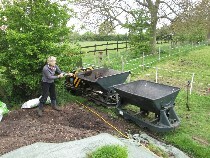 It was good watching someone else do the hard work for a change, but I'm not sure she saw it that way! After the Motor Rail had a run up and down the line, No.12 pushed it back to the sheds. 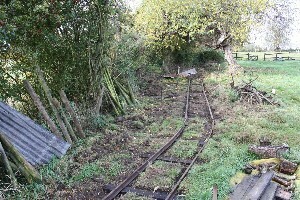 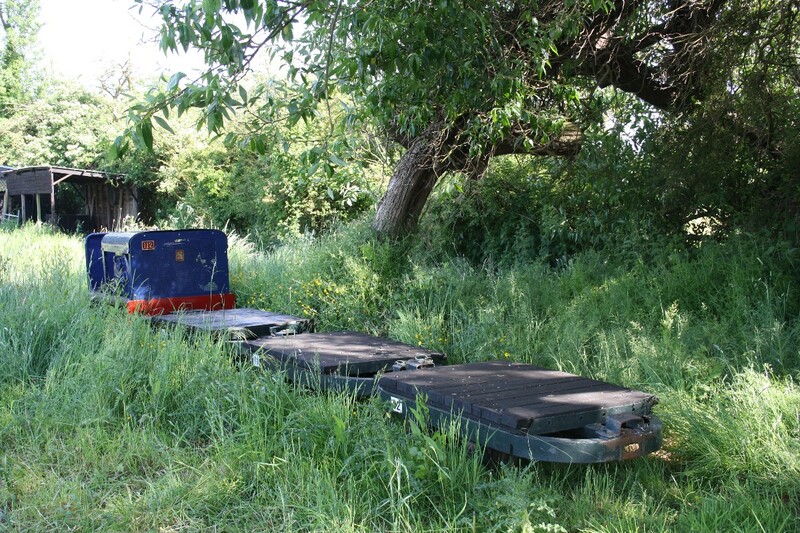 At the height of summer the grass and weeds tend to take over and the tracks soon disappear from view. 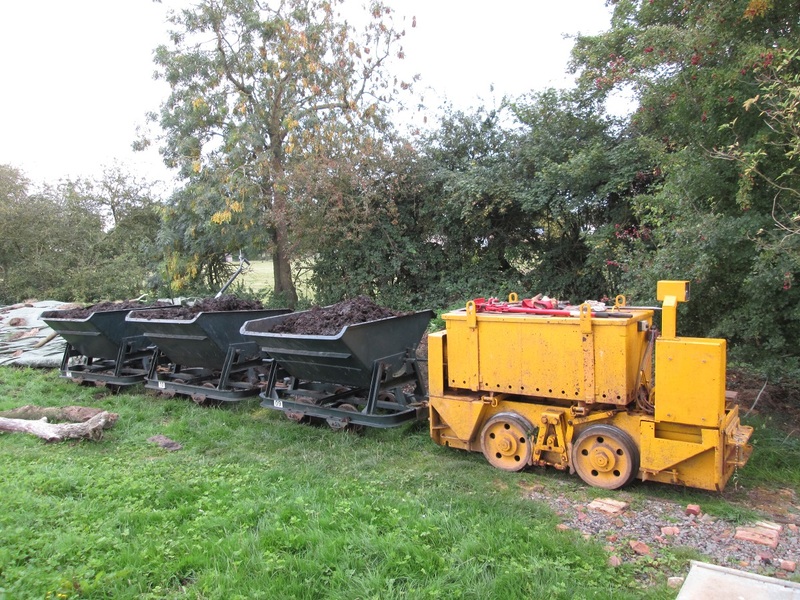 The railway continues to perform well, in the winter months moving the muck to the muckheap and the horse feed to the stables in the winter, and digging out the composted manure into skips over the summer months. 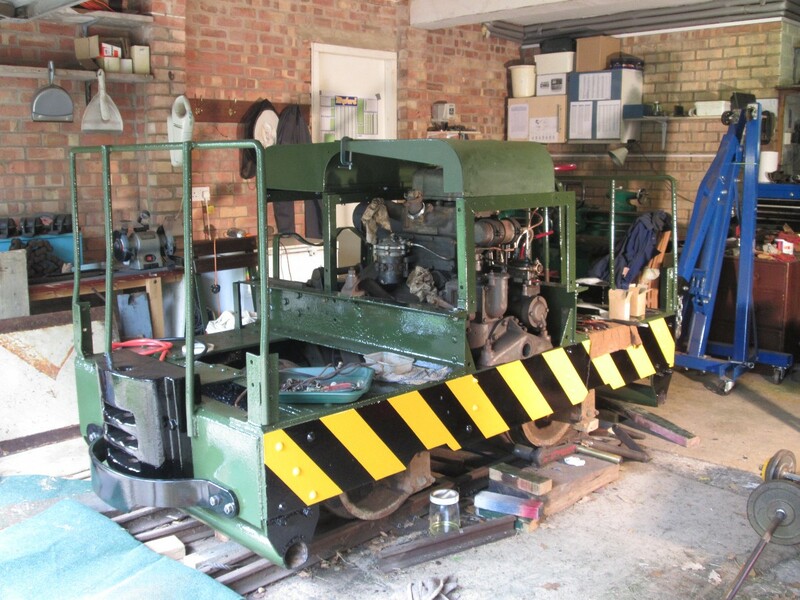 The long awaited sound of the 2 cylinder doorman engine jumping into life was finally heard and the loco moved under its own power for the first time for possibly 20 or more years. The downside was that it now highlighted a raft of other jobs that needed doing; the original oil filter needed replacing, brakes needed adjusting, work needed on the clutch, and the plentiful white smoke suggesting that the piston rings may need replacing. 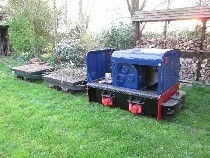 Later the same month the loco was finally complete (and thankfully no more leaks from the radiator and pipework). 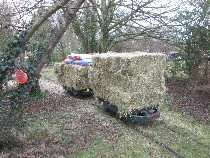 It was pulled out onto the main line to try and push start as hand cranking it had not been successful. Now with the water pipework as the main job left to do before trying to start up, the loco was partially pushed out of the garage for a few photos. 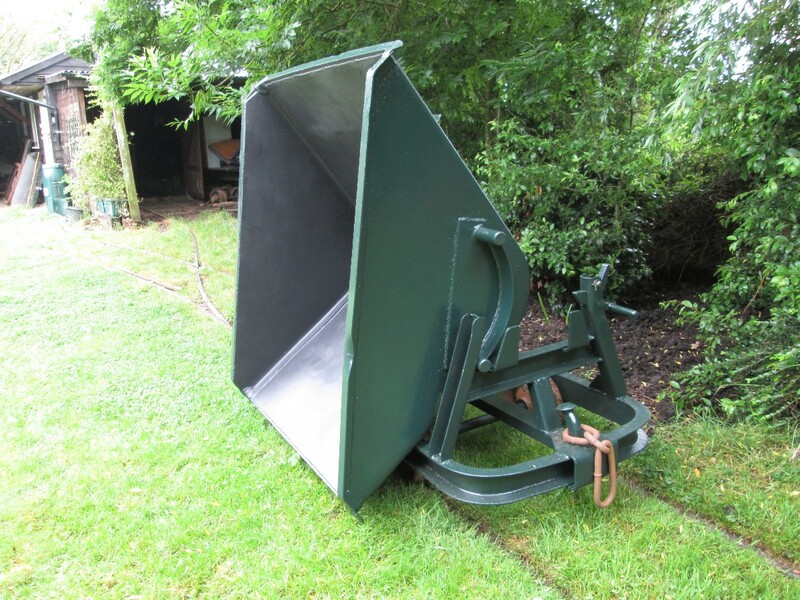 In June, the last skip had been finished, and a thick coat of the roofing paint put inside the skip as usual, to give better protection against the corrosive properties of the fresh manure. The (very leaky) radiator from Jane had been stripped down and rebuilt over a year ago, and had been waiting patiently to be reunited with the loco. 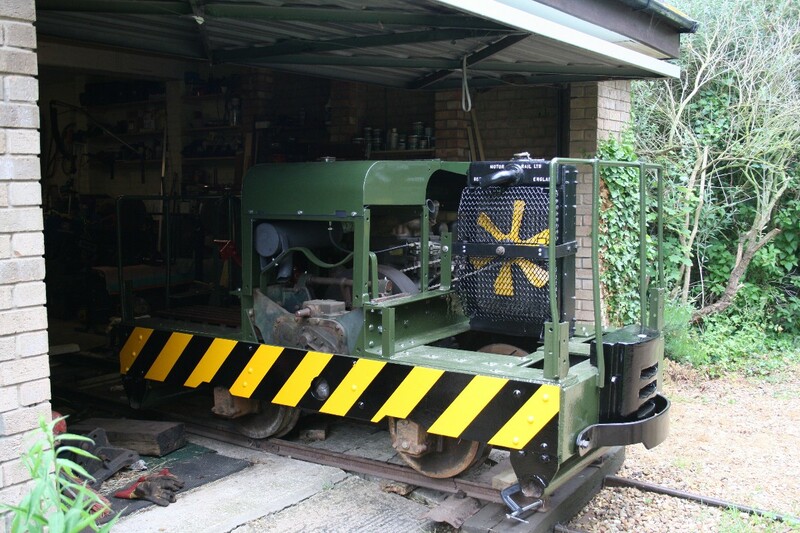 With the brakes and chains in place, and the frame painted, the radiator was placed back on the loco and the fan and mounting bracket bolted back on. 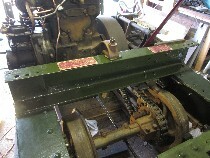 Brammer belting was used to connect up the fan to the pulley next to the flywheel. An hour later following the previous picture, the loco has hauled the bagged compost back and is ready for loading up and taking round the village. 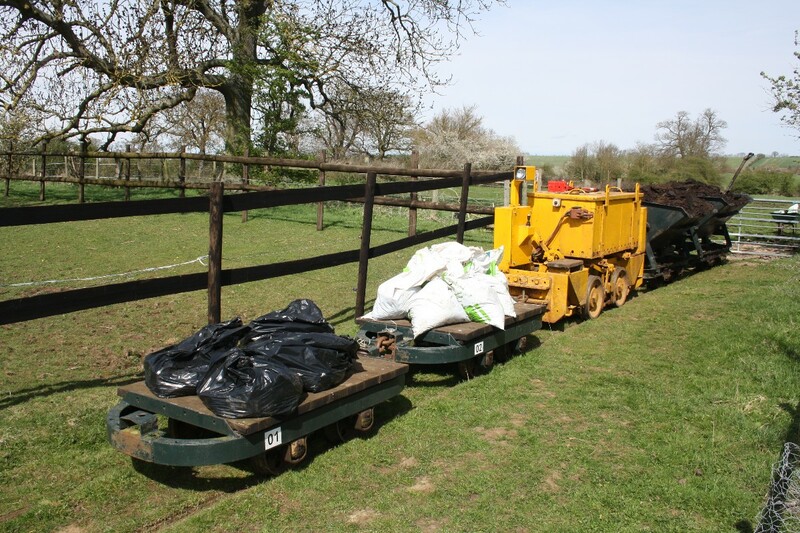 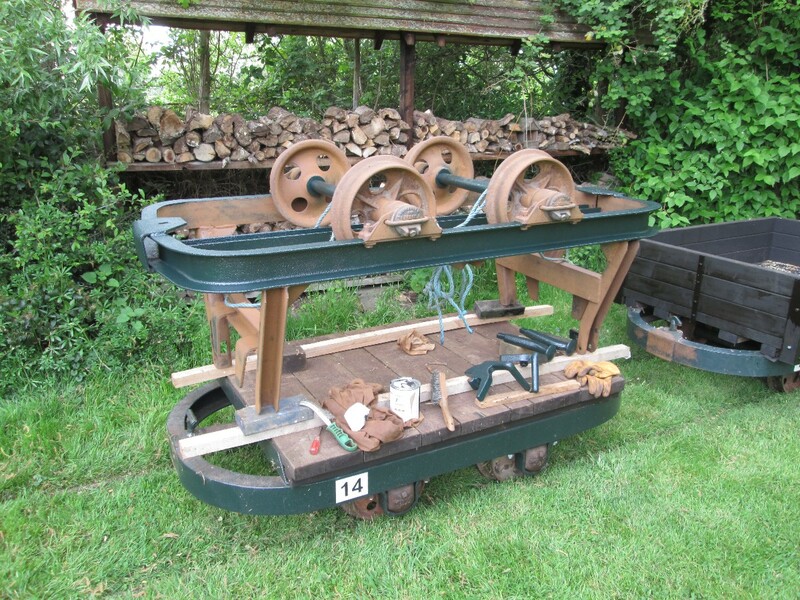 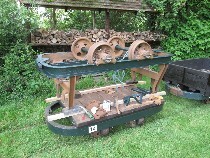 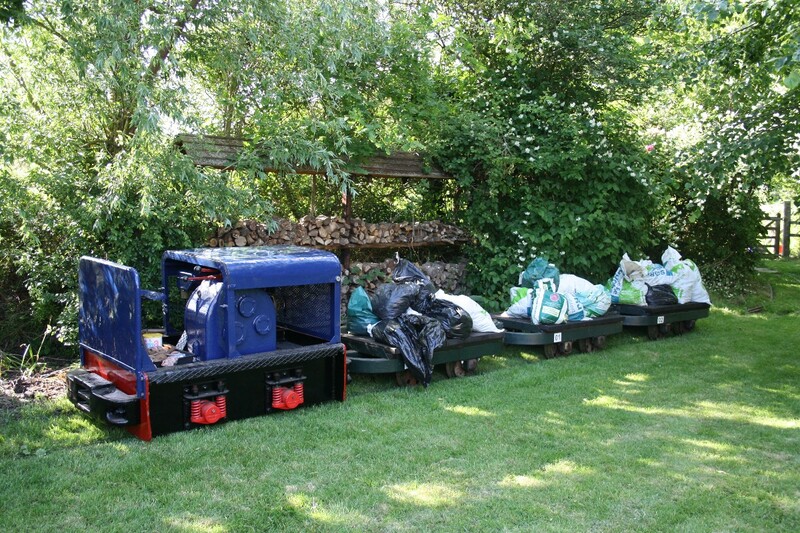 On another weekend in May the Spoor was given an outing to push a few flat wagons out for loading with bagged compost. At this stage of the season the line is beggining to get a little overgrown but it is down there somewhere. When the weather permits, the typical activity in spring is digging out the manure, and No.10 has been used to push a couple of skips oout to the muck heap for this. 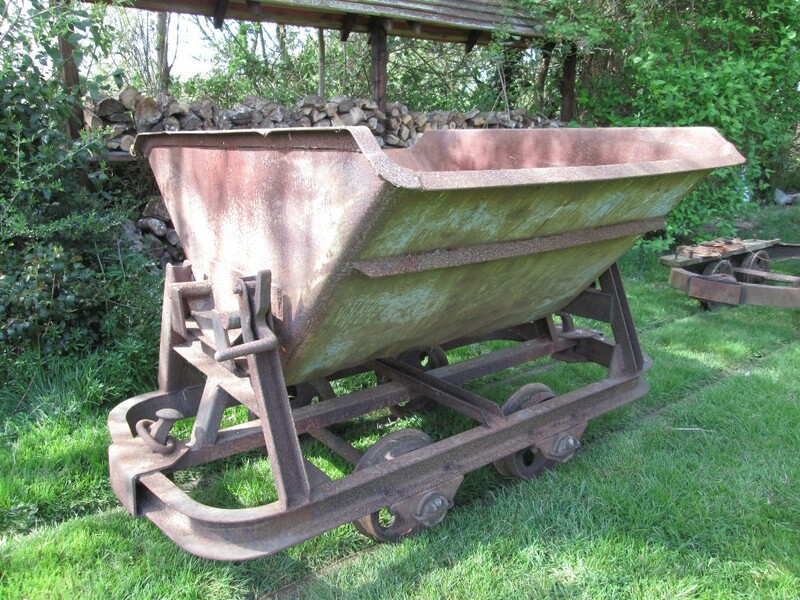 By May, time had been found to do a bit more work on the last German skip and after cleaning up it was receiving it's first coat of Hammerite. 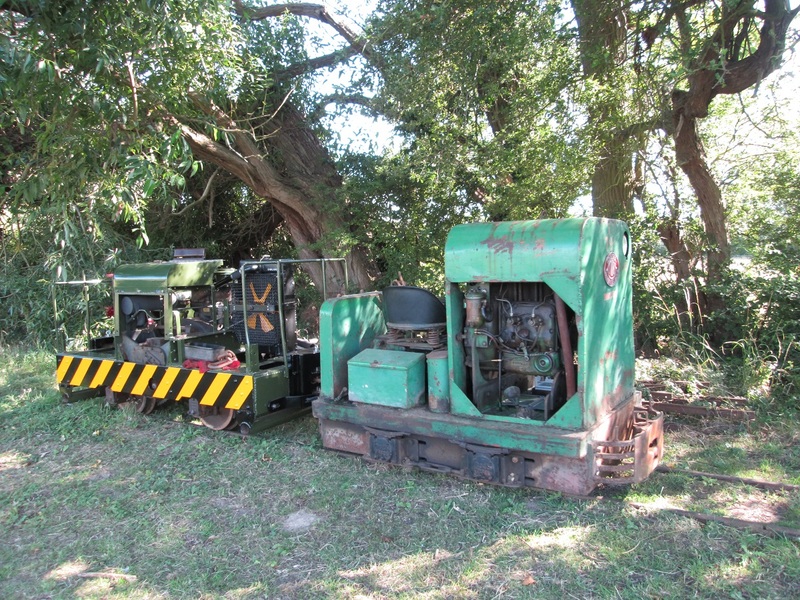 The new Diema loco had spent the winter and spring at the back of the loco shed and for a second time it was hauled out for an attempted push start. 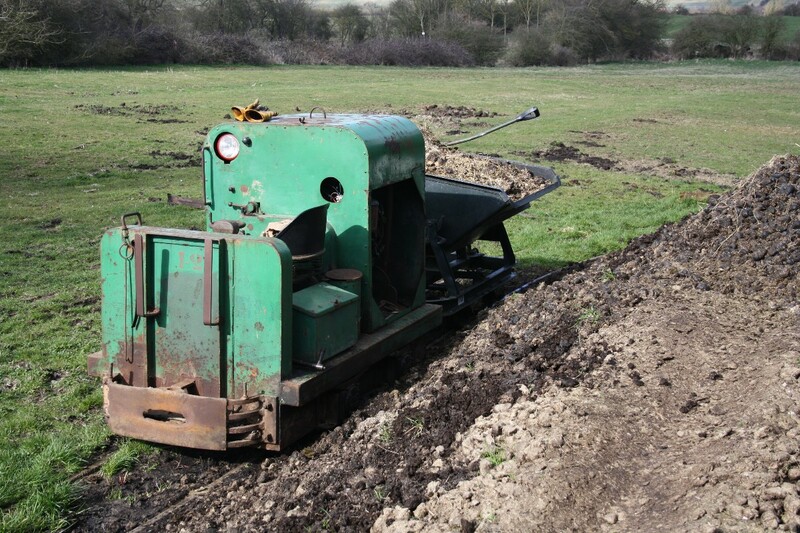 The fuel tank which had significant rust inside was bypassed and the loco was pulled onto a decent stretch of straight track. Although there appears to be good compression, when attempting the push start there is no sign of any combustion/smoke from the exhaust, and after numerous attempts she was just put away again, pending further thought on the best course of action to identify the problem. 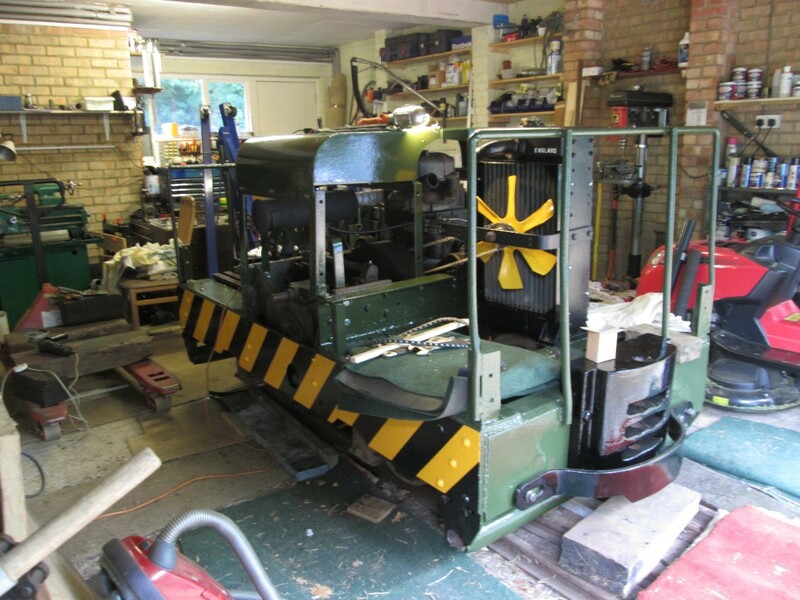 Now with the wasp stripes complete, the buffer strips fitted at the right height, most of the work on the lower frame was complete. 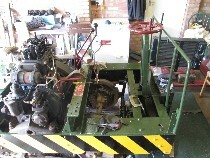 Work progressed now on the fitting of the engine cover, fuel tank and various bits of pipework. Following on from the previous picture, the 2 skips were filed with composted manure for tipping/spreading on the fields, and the plastic bags were for delivery in the village. 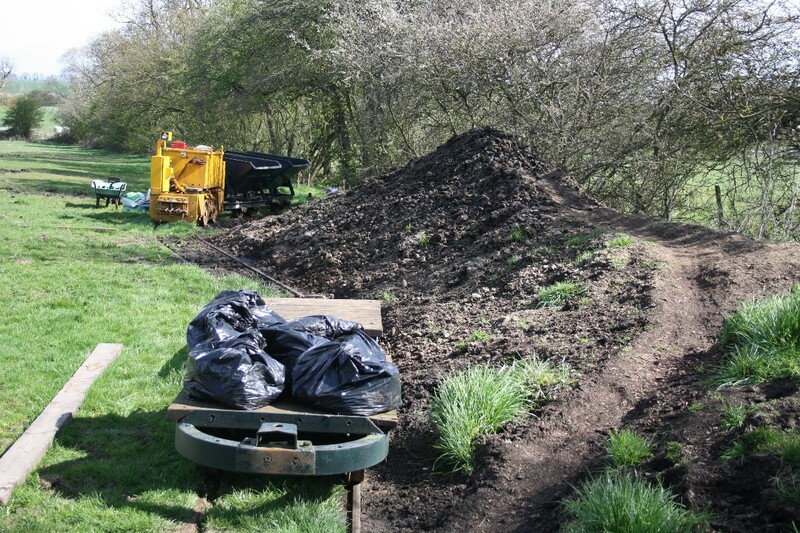 The extent of the muck heap by this time was all the way to the end of the line. 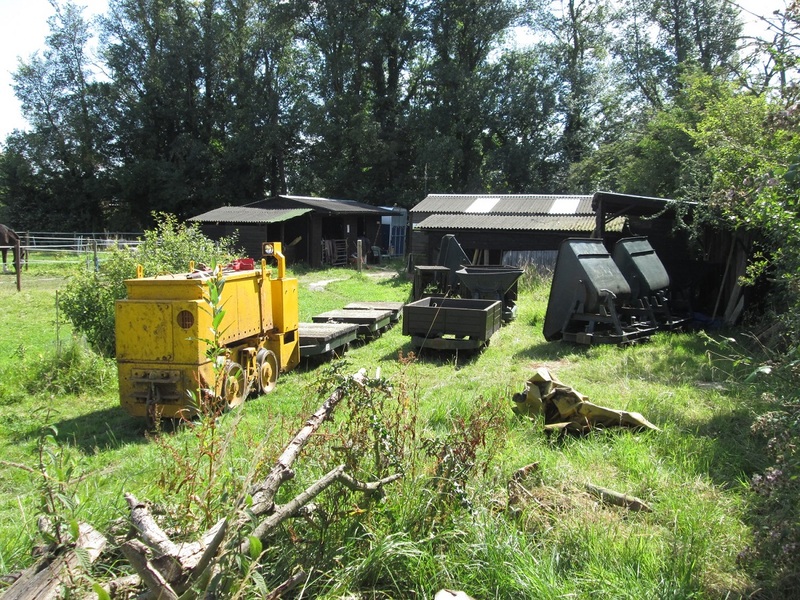 A couple of skips have just been unloaded onto the working end of the pile and a few more plastic bags are being collected on the flat wagons. 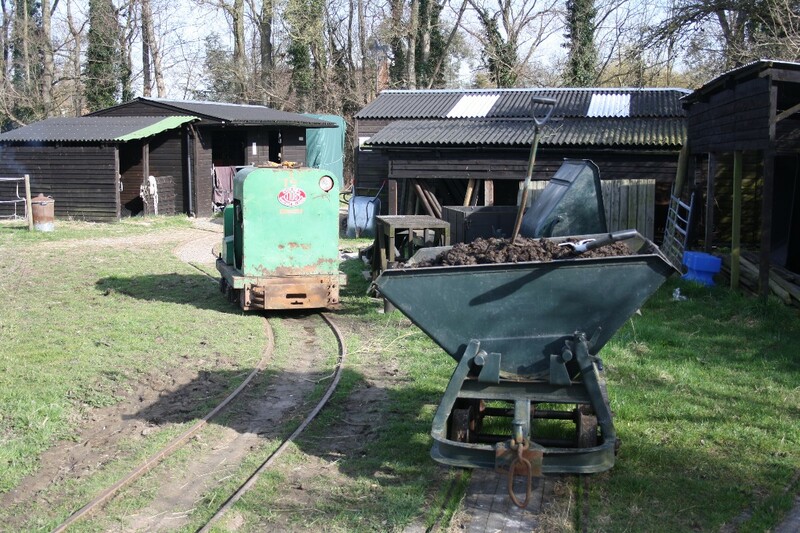 April time is typically when the composted manure is started to be dug out, and the W&R loco is seen here at the back of the stables with a number of bags of manure which had been filled from the skip behind the loco. 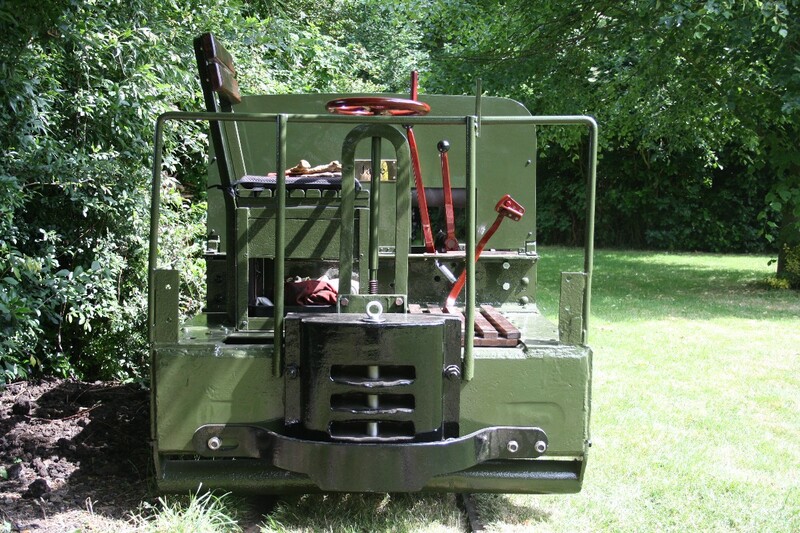 When Jane was obtained she did not have either of the steel buffer strips which fit infront of the coupling blocks. 2 were gratefully obtained from the Leighton Buzzard Railway, but when offered up to the existing locating holes for the first time, these were far higher than the original factory drilled holes should have been, which would have prevented coupling up at the correct height, so new holes had to be drilled out (blunting a number of drill bits in the process! 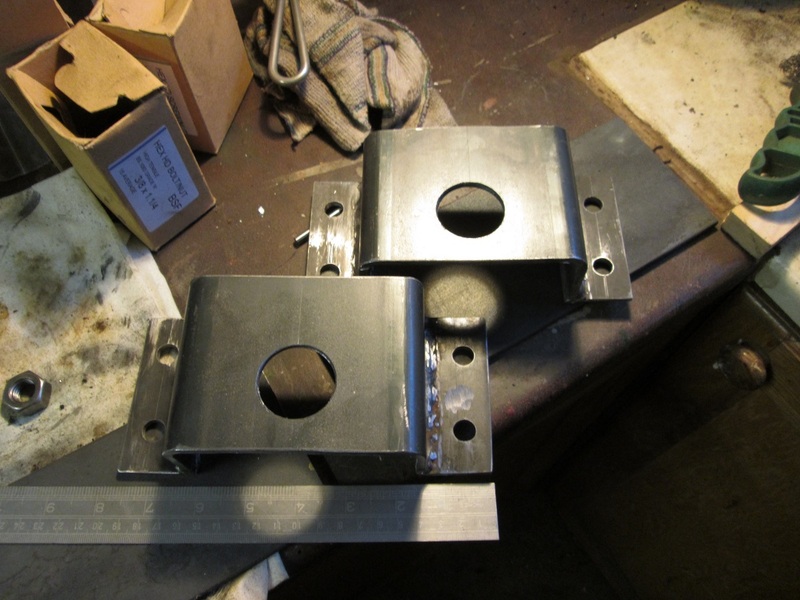 ), and the old ones were filled/welded up. The pic shows the 3 holes at the right height and primer now covering the area around the filled up holes. 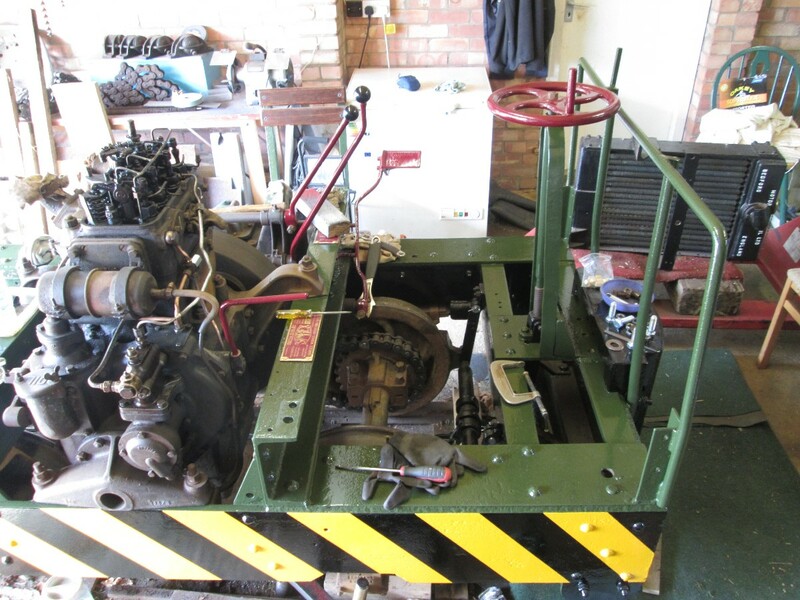 Following the fitting of the brake gear, the brake shaft/wheel was refitted and aligned, and the rest of the throttle, clutch, and gear direction controls, were bolted back on. 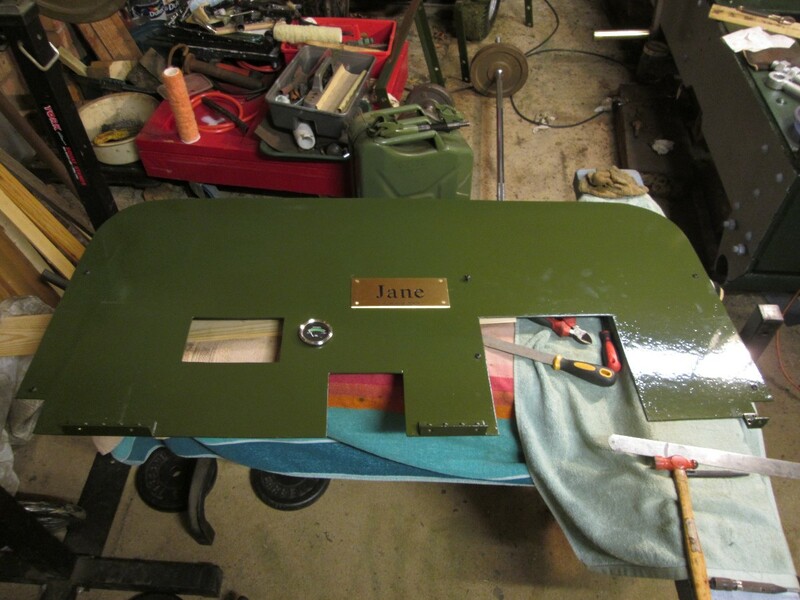 On Jane the direction/speed plate and the builders plate had been carefully removed previously and had been cleaned up and gently hammered back into something resembling flat and then painted. Now the frames had completed their final top coat these plates were reinstated. 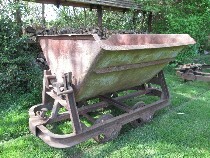 By April time the latest German skip was moved out so it could be taken apart for a thorough clean prior to paining. Currently it's livery consisted of 100% rust. 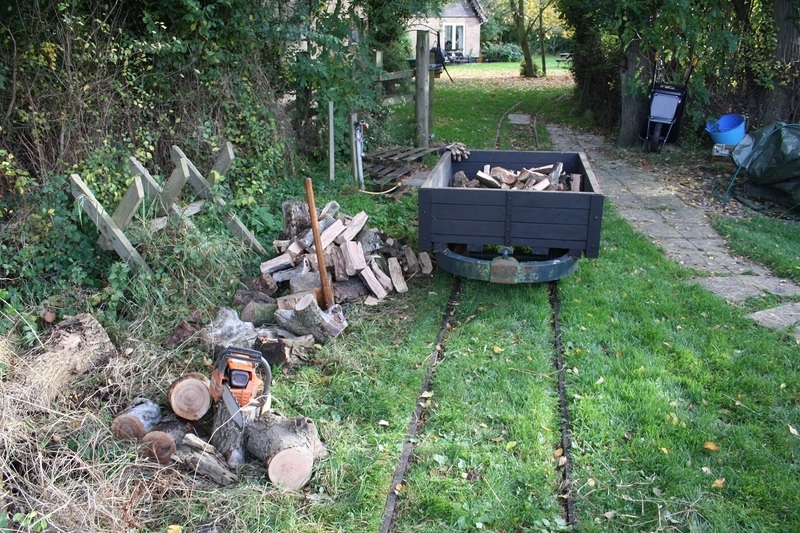 The tiny Spoor was given a run out by the time the weather was warm enough for it to be hand cranked successfully. 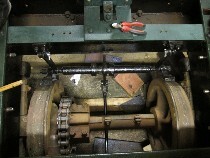 It does have a holder to accept the lighted fuses for a cold start, but not easy to do when there is just one person. Following the location of a spare 40s fuel tank at Bolton Fell Peatworks before closure, even though it was in a far better condition than the original, it took a lot of work of derusting, sanding down, filling, more sanding down, to acheive a smooth enough finish for painting. 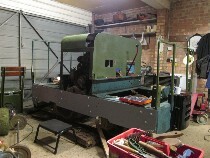 Even then it is not 100% satisfactory. The painting for Jane included wasp warning stripes down the side of the loco. 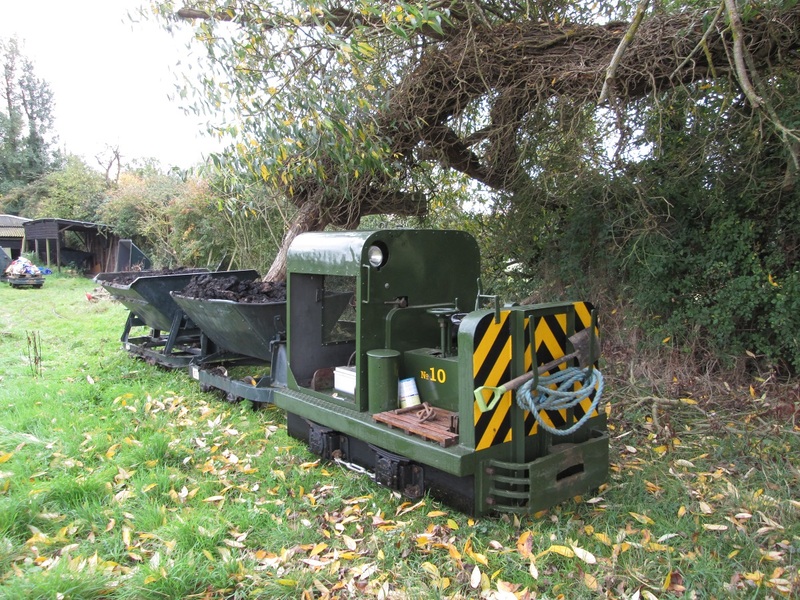 There is no evidence that this was part of any previous livery, but is a useful inclusion as the locos are around horses a lot of the time. 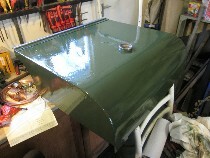 This is achieved by masking off and doing the 2 coats of yellow topcoat, then remasking and doing the 2 coats of black on the remaining stripes. 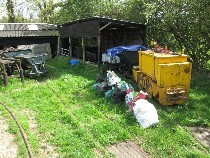 At the back of the stables in March, one skip was now full and awaiting tipping. Mo�s No.12 was given the job of pushing it to the muck heap. 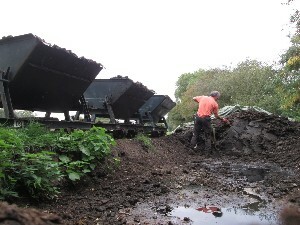 Arriving at the muck heap the skip is unloaded by hand. The lorry driver delivering the horse feed was now well trained, so if a couple of flat wagons had been pushed down to the driveway, he would load the hay and feed bags directly onto the available wagons. 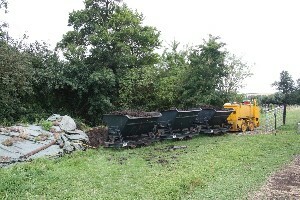 Sometimes they are hand pushed one at a time to the stables for unloading. 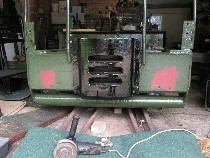 The back cabsheet was finished, including various holes to allow fixing to the steel angle of the engine cover. 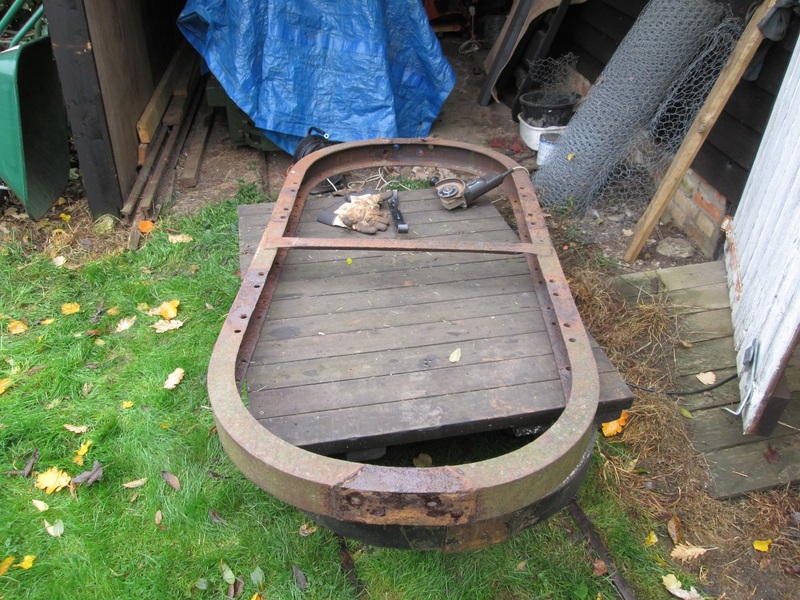 A bass plate was fixed achnowedging the name given to her from her time on the Ffestiniog Railway. 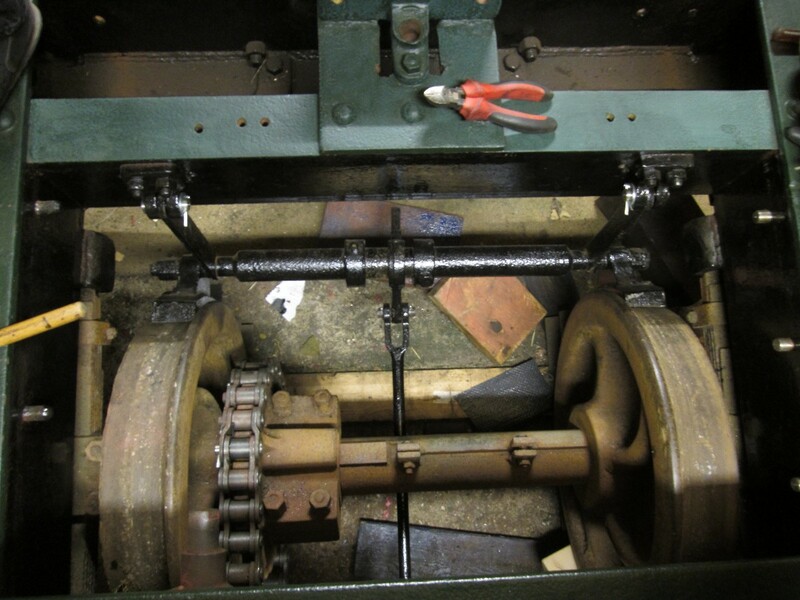 After new pins had been made for the brake hangers to fit onto the brackets on the frame, the brakes were fitted back on the loco. By this time Jane was in various stages of undercoat and test fitting parts of the engine covers.